An important historical figure in Benevento between the end of the seventeenth century and the first third of the eighteenth century was Vincenzo Maria Orsini, Archbishop of Benevento and later Pope Benedict XIII from 1724 to 1730. The magnificent Chapel of San Gennaro in Benevento's church of the Annunciation is dedicated to him. Decorated with precious marble opus sectile work by Neapolitan workers, the chapel is crowned by a marble portrait of Orsini attributed to the Roman sculptor Pietro Bracci. This period has left behind some important reminders of the sophistication of Orsini-era tastes in the Benevento archdiocese in the form of numerous works that adorn the churches of Guardia Sanframondi, the work of Paolo de Matteis (1662-1728), one of the leading figures in Neapolitan painting in the era of Luca Giordano and Francesco Solimena, an artist much admired by Orsini. 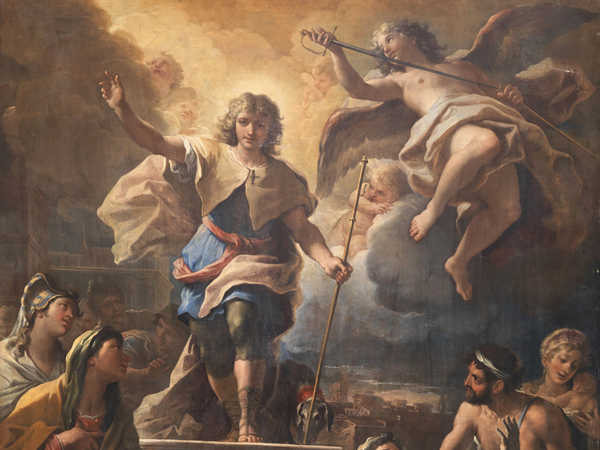 An interesting overview of the painters working in the archdiocese can be gained by a visit to the Cathedral of Our Lady of the Assumption at Sant'Agata dei Goti, where there are works by Saverio Persico, Giuseppe Tomajoli and, most importantly, Tommaso Giaquinto (1661-1717), an artist who was particularly active in Sant'Agata and its surrounding area. Not far from Sant'Agata dei Goti is the must-see old town of Cerreto Sannita, built from scratch by Marzio III Carafa according to a precise urban plan immediately after the violent earthquake of 1688, which completely destroyed the old medieval centre. Of particular interest are its ceramic workshops, which continue the tradition of the older Cerreto factory.